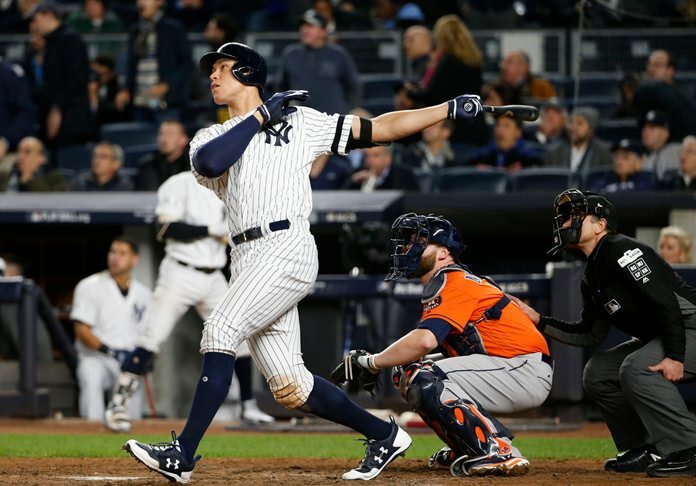 New York (AP) — With a soaring shot headed for Yankee Stadium’s Monument Park, Aaron Judge got New York back on track for another memorable October. Judge ignited a rousing rally with a home run, then doubled during a four-run eighth inning to spur the New York Yankees over the Houston Astros 6-4 Tuesday night and level the AL Championship Series 2-2. The Baby Bombers trailed 4-0 against starter Lance McCullers Jr. until Judge homered leading off the seventh. He tied it with a line drive that nearly left the park in the eighth and scored when Gary Sanchez hit a go-ahead two-run double off Ken Giles.